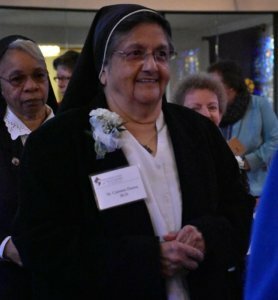 BAYNESVILLE – As a young girl in Illinois, Sister of the Good Shepherd Carmen Flores knew her vocation was in religious life, but could not decide on an order. 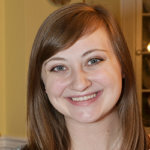 While discerning her vocation after high school, a priest gave her a book filled with options. She paged through it while at her workplace, where a coworker approached her. The woman flipped to the Sisters of Good Shepherd and told Sister Carmen that this was the one she wanted. The sisters had cared for the woman when she was a young girl. She was among more than 60 religious men and women who celebrated milestones on the World Day for Consecrated Life March 3 with Mass and a luncheon at Immaculate Heart of Mary in Baynesville. Sister Carmen joyfully spoke of her time spent caring for adolescent girls as she recalled her 50 years in consecrated life. While the Sisters of the Good Shepherd have closed their Baltimore facility, which served adolescents with severe emotional and behavioral issues for 153 years, due to financial struggles, Sister Carmen remains with a handful of others to see the transition through. In addition to religious women and priests, the celebration included religious brothers, such as Brother John Chung Nguyen. He answered his vocational call in his native land of Vietnam, where the Brothers of the Christian Schools, who were his schoolteachers, inspired him to join. Other than a short break, since 1985 he has taught at Calvert Hall College High School in Towson, where he introduced personal computers to the students. School Sister of Notre Dame Barbara Brumleve, celebrating 60 years, was likewise influenced by her earliest teachers. “We work, we work, we pray and we work,” said Oblate Sister of Providence Mary Gabriel Walker. Fellow Oblate Sister Hélène Thérèse Stanislaus said that religious women in their order work in a “potpourri” of ministries. Sister Hélène Thérèse was taught by religious women, and found that certain orders were not ready for women of different races. She was recommended to the Oblate Sisters of Providence, the first successful order established by women of African descent. Sister Hélène Thérèse was impressed with their hardworking nature, and fell in love.